My Weeks Leading up to Thanksgiving Break! I am back in then Bay Area, relaxed and finally have time to update my blog. So the reason I went missing for a week was because of excessive midterm and the typical end of the semester rush, but I finally have time to take a breather. So the last couple weeks, along with the buzz of everything, I have been to a couple awesome places in LA I would like to talk about! For Global Medical Brigades, with whom I am traveling to Honduras this December break with, we are currently getting trained to measure Blood Pressure, Blood-Glucose levels, take vitals, and speak Spanish! We are also trying to get to know each other better so we can have good communication and a good bond for a successful trip! I am currently raising money for my trip on http://www.empowered.org/Soumya-Murag , I am half way with my fundraising goals but I still need help to raise about $800.00 for the trip! Anyone can donate! Read my previous blog about my upcoming Honduras trip and what I will be doing there. 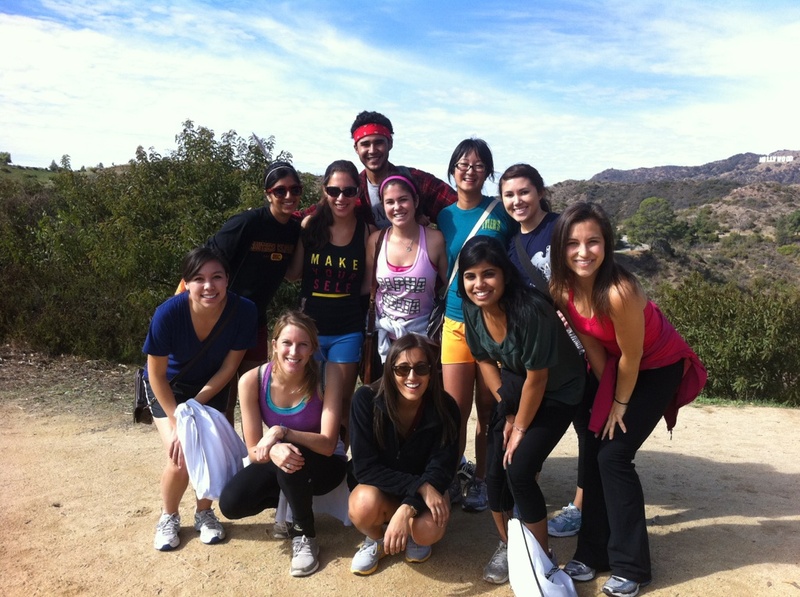 But anyways, getting back to the topic, for member bonding purposes, we all took a trip to Griffith Observatory Park! It is an “icon of Los Angeles,” located in the Hollywood Hills overlooking the majority of Los Angeles. We went hiking among the rigorous mountains and then experimented by measuring blood pressure. especially during the night, you are able to see a majority of the stars, which are honestly invisible among the smog of LA in most places. Here are a couple pictures. Hollywood sign in the back woot woot! That is an other awesome hike to go on by the way! My awesome fellow brigaders, all sweaty from the hike! The awesome building that is the actual observatory up there! After hiking, we were all really hungry and decide to hit up Alcove Cafe! Apparently Mila Kunis and many other actors regularly eat there, so we were super excited! We did not see anyone famous, but it didn’t matter because the food just swept us off our feet. Definitely check it out if you have a chance, it is a very LA thing to do as in it is has the perfect feel of LA. The outside seating, the cute tables, the rush and crowd and buzz of people and amazing food! Anyways, I am really excited to be going on this trip because the people are so amazing. I just have 3 weeks of school: 1 week of classes and 2 weeks of Finals until December break where I will be coming home for Christmas and my 19th Birthday! and for New Years. January 1st, I am headed right to Honduras for a bout a week! I’ve been very busy also with helping GMB gather medicines! We take a bunch of medications with us, so in order to do this, we fund raise enough money to go to dollar stores and buy a bunch of asprin, Tylenol, important creams and sunscreen, etc, in order to take enough medication to last two months for a single patient! I’ve also been just occupied with my cardiovascular research, a bunch of stuff for Associated Students of Biomedical Engineering and of course my classes! I am having a good time at home now and the best parts are: visiting high school friends, feasting especially because I have missed home cooked food, and sleeping on my huge bed for long periods of time!